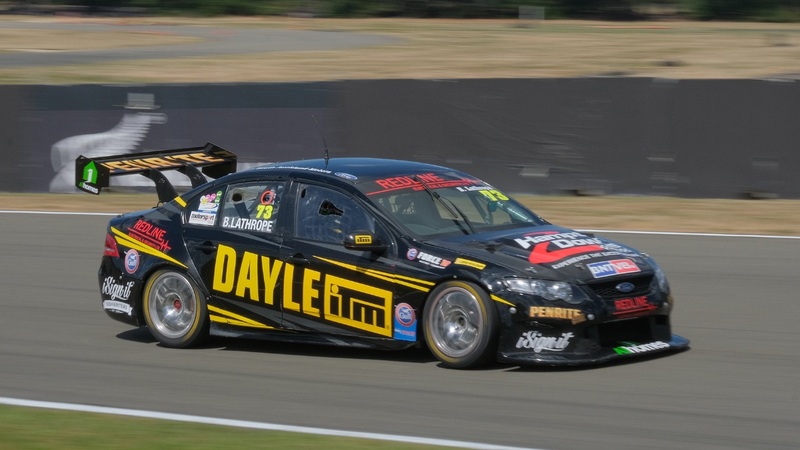 BNT V8 driver Brad Lathrope relished the challenge of racing at Manfeild Circuit Chris Amon at Feilding this weekend. “I really enjoy racing down here, Manfeild is a fun track. It looks easy on paper but it’s actually quite technical. If you can get it right and flow all the corners together it’s wicked,” Brad says. His Dayle ITM #73 Ford Falcon super tourer might look a little worse for wear but there is a month now until the sixth and final round at Hampton Downs on March 8-10 to give it a late season birthday. The weather gods turned it on for the racers, with temperatures siting around 28degC both days, making for a hot, dry track. Brad qualified sixth and started in that position for race one, before gaining a couple of positons off the start. An altercation with another competitor earned him a 10sec time penalty which dropped him back to seventh for that race. The race didn’t have a happy ending despite the Dayle ITM Ford showing some good pace. Race two and three were less dramatic and Brad started them in seventh and moved up a posiiton to finish both in sixth place. His team will have some work to do on the car over the coming weeks to repair some cosmetic damage. Brad’s team came down from Auckland and have “all taken on the knowledge of what we have learned from Barry Leith and Kev Murdoch who helped out at the two South Island rounds,” he says. As always, Brad is grateful for the support of all his sponsors. Brad Lathrope Racing thanks the following sponsors for their support: Dayle ITM, Redline Electrical and Security, A1 Homes, Penrite oil, Motorsport Communications, iSignIt, Ultimate Performance and AV8 Motorsport. CAPTION: Auckland’s Brad Lathrope enjoyed racing his Dayle ITM #73 Ford Falcon super tourer at round five of the BNT V8s at Manfeild Circuit Chris Amon at Feilding. PHOTOS CREDIT: GEOFF RIDDER.